This month Nikki and I visited Eight Sushi Lounge. I'd never been and Nikki had been before only once. Both sushi lovers, we were anxious and highly anticipating this experience. And an experience it was! Around the corner from many other top Atlanta restaurants, Eight Sushi Lounge is located in the booming, restaurant-rich West Midtown area in Atlanta. Welcome back to our Top 10 Atlanta Restaurants "By the Numbers", a monthly series by wanderlust ATLANTA and super-popular food Instagramer atlantafoodie! 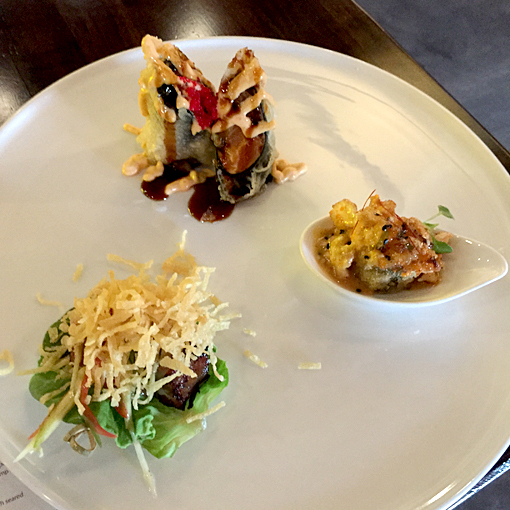 Our eighth stop on this 10 restaurant tour was Eight Sushi Lounge. What we believe is a unique spin on 'Top 10' lists, we're not counting down, but instead, we're showcasing some of Atlanta's restaurants with numbers in their names! Some we've been to before and others will be a first-time experience. We're going to make all of them FUN! This was such an incredible dining experience, and we've only experienced the tip of the iceberg! We'll be back for more and more and more! Allow us to share with you first what was one of our mutually favorite dishes from this visit. 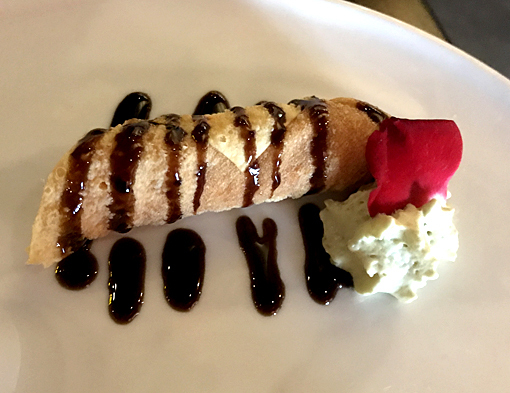 The "Windmill Roll" is as delicious as it is beautiful! It gets its name from the lotus chip (the best lotus chip I've ever had!) that's nestled between this two-story experience. 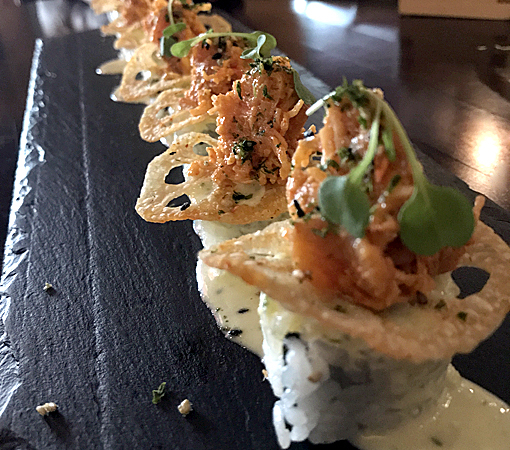 Our server, Ivy—more about her coming up—explained that most diners enjoy this in two, simultaneous bites...picking up the Cajun-spiced lotus chip topped with spicy tuna and crab salad and immediately following with the roll of spicy yellow tail and tempura crunch. Perfectly enjoyable individually, I recommend trying all of these flavors together. "Experience an Evolution in Sushi" is the motto of Eight Sushi Lounge. Very fitting indeed. Nikki and I both are already eager to return, knowing full well that every visit will be an evolution of our previous sushi experience here. Indeed, it's a revolution in Japanese cuisine. 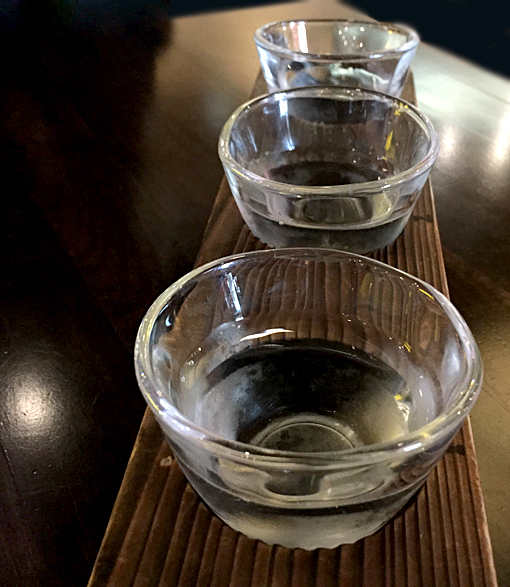 I started with the Sake Flight, a sample of three of the restaurant's premium sakes. Nikki enjoyed the same a little later in the meal. Each sake was different, not drastically, but notably. If you're a sake enthusiast, I think you'll very much enjoy this. If you're new to sake, do try it. These are far superior to what you might haphazardly find in your local liquor store. We'd planned our visit to Eight Sushi Lounge without much research. We knew that their sushi presentations are often quite spectacular and I'd learned that it's a second generation family-owned business, but otherwise, we were hopeful for a lovely experience. Unaware they had happy hour specials, we were delighted to find that those specials included a 3 for $10 "Miso Happy Before Dark" special, which features some totally amazing bites! We, of course, wanted to sample as much as we could so that we'd be amply prepared to share with you what is amazing about the menu. Wow! What a great start! Our first 3-bite sampler included the "Sunday Morning" roll (top). 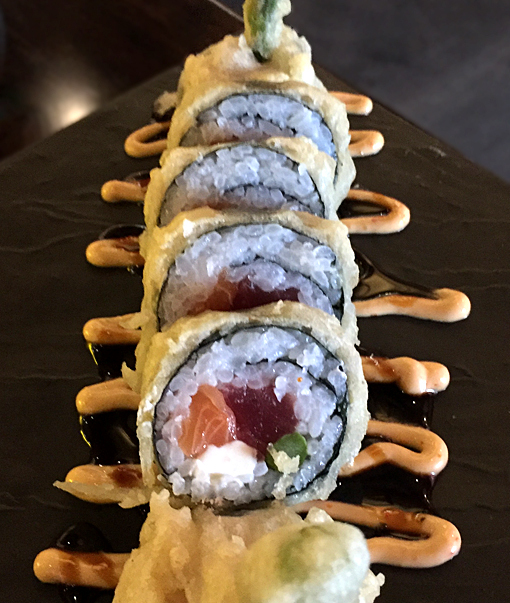 With an excellent flavor and gorgeous presentation, this one has spicy tuna, spicy salmon, and avocado, that's flash-fried in nori and topped with Eight's house sauce. Also in this round was the Pork Belly Lettuce Wrap (lower left). Personally, I didn't think I was a fan of pork belly, but this is absolutely amazing! The meat-to-fat ratio is heavier on the meat—not that I have to have a ton of meat, but I don't like a mouthful of fat either. I found the flavor to be mild, yet rich at the same time. It's composed of braised pork belly and green mango salad with a spicy almond butter sauce! Sounds amazing, right? 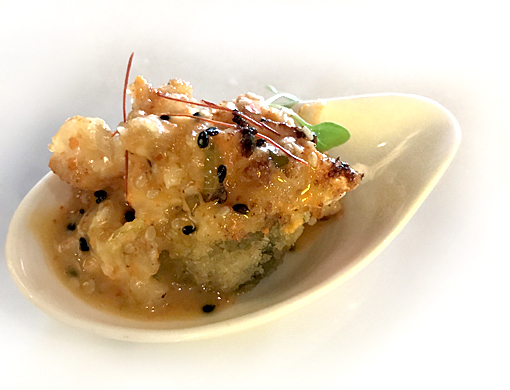 The third dish on our first sampler plate was the Langoustine—a crispy spicy tuna and crunchy baked scampi! The sauce is amazing and just a little bit spicy. I love spicy—flavor and heat! Nikki particularly liked the sauce in this bite. Don't pass this one up. The Yummy Roll is exactly that...yummy! It's milder on flavor and wholly delicious. A basic roll presented beautifully, this one has tuna, salmon, cream cheese, and asparagus. It's lightly fried in nori and served with Eight's house sauce. Their house sauce totally rocks! Eight Sushi Lounge has something for every level of sushi diner. If you're brand new to raw fish, I think the Yummy Roll is a great roll to start with. I personally started with the—now cliche—California Roll and then quickly graduated to much more adventurous options, which are infinite! 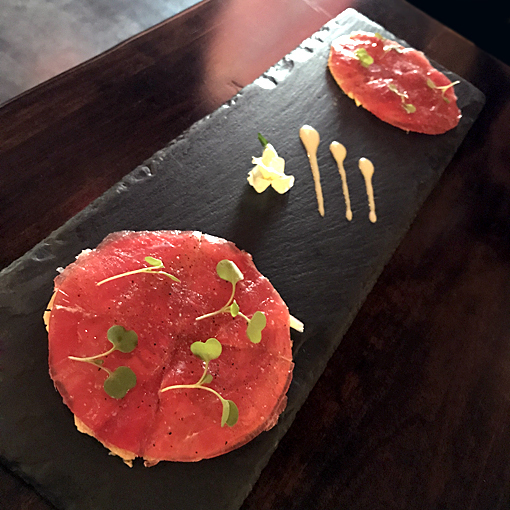 Tuna is my go-to, whether tartare, seared, or sashimi...I love tuna! Nikki's been enjoying sushi for years, so I very often defer to her menu choices. I'm so lucky to have a 'sushi expert' friend! We both enjoyed a libation, of course. I had the Strawberry Popscile! I love berries, but this was special. 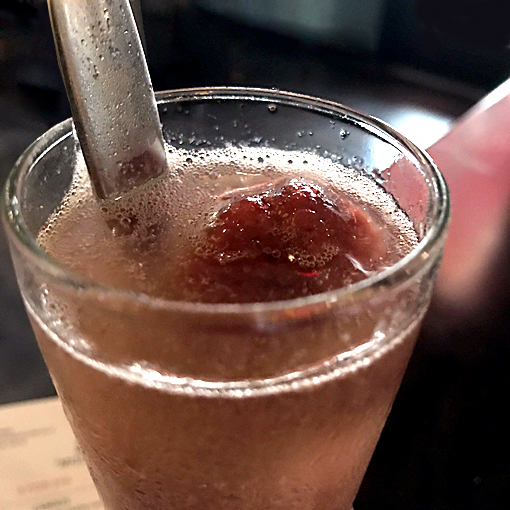 It's fruity, fun, bubbly, not too sweet and by the time you're done, the berries have dissolved to practically the same consistency of your cocktail, so you're able to enjoy your drink without having to fish out the berry goodness. Nikki had the Purple Heart cocktail, made of Shochu, vodka, blueberries, thyme, lemon, and soda. She particularly enjoyed the unique thyme flavor. The dishes kept getting better and better...and it wasn't the sake talking. Nikki and I, the enthusiastic eaters we are, ordered another 3-for-10 sampler. The variation of offerings is absolutely wonderful! 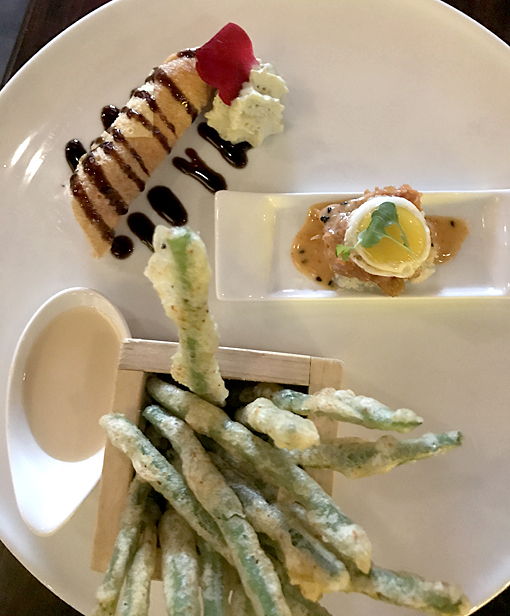 There's everything from an elevated vegetable, such as the Green Bean Fries offered with a Truffle Aioli, to their Kushiage Fish Cake offered with a soy reduction and serrano sauce. We didn't have the latter, but definitely trying that one next time! The "Eggs Benedict", one of Nikki's choices, is a nod to breakfast and totally "delish" (Yes, @atlantafoodie uses "delish" as a descriptor, as do I.). Nikki really likes quail egg, whereas it's not the first thing to grab my attention. But, THIS quail egg is amazing. I don't know if it's the source of the eggs or the preparation—my guess is the latter—but this dish leaves you with a delightful sensory experience that you'll want to have again and again. 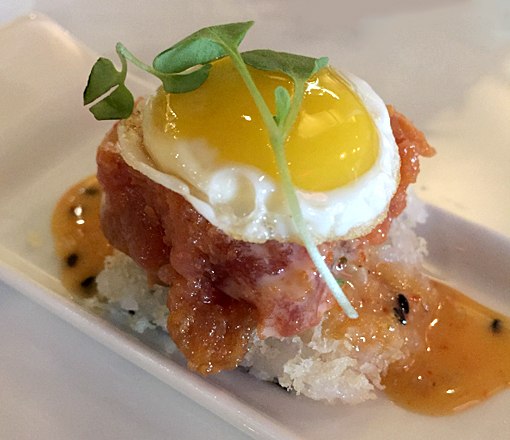 This bite is composed of a bed or rice, spicy tuna, shiso leaf and a sunny side up quail egg! Again, "delish!" Surprise, surprise...the "Canolis" is a savory roll! The roll is stuffed with hamachi or king crab and the "whipped cream" is an avocado mousse. Absolutely delicious! I'd forego sweetness and have this for dessert, too, it's so good! The "Tuna Crisps" was a favorite of mine and Nikki's...beautifully presented, too! I love that there are no forks or spoons on the table. You get chopsticks. I'm sure they have forks and spoons in the back, but what's the fun in that?! I like to think that I'm pretty good with chopsticks, but I have to say that I hope no one was watching me attempting to enjoy this dish with grace and style. I looked like such a rookie! But I persevered. Didn't have a choice...it's so delicious and I wasn't waiting for a fork to enjoy it! Not that I would ever ask for a fork in a Japanese restaurant. When in Rome, people. When in Rome! If you're new to chopsticks, "Just do it." You'll get better with practice and no one is going to judge you for good effort. Promise! New on the menu, I had to have "The Alchemist" even before I knew what it was. The name alone is super cool! After we heard the description—being the fun-loving diners we are—there was no other choice but to order it! This dessert is delicious, but the "experience" is what it's all about! The "Experiment": everything for this dessert is served all at once, but the diner has the awesome experience of conducting the "experiment" in multiple stages. Components: 1) A HUGE scoop of exquisite vanilla ice cream; 2) A rack of four test tubes containing: puffed rice crunchies, blueberries, and peach pearls and green apple pearls; and 3) A vial of plum liqueur. Plum liqueur, people! NOTE: The toppings change from time to time, so please do tell us what yours were! Instructions: 1) Take photos; 2) Pour the contents of each test tube onto your ice cream, with childish delight; 3) Pour the plum liqueur over the top of everything! ; 4) Put the mint back on top of your ice cream; 5) Take another photo of the fully composed "experiment"; 6) Dig in and enjoy this delicious, wholly fun and totally delicious dessert! ; and 7) Tell all your friends how much fun this is! I want to do that again, right now! Nikki, @atlantafoodie on Instagram and "By the Numbers" partner, is great about giving a "preview" of our upcoming posts. This time, the comments on the sushi photos she posted prior to publishing this post, have received multiple comments, all saying, "Best Sushi in Atlanta!" We see why! Ivy is AWESOME! We could not have asked for better service. By the time we left, Ivy seemed more like a friend having us over for dinner than a restaurant server. She enthusiastically shared with us the inside scoop about new dishes and how they're most enjoyed, and her enthusiasm for Eight Sushi Lounge's food and menu development shined like a beacon! "Thank you, Ivy!" Dining options include the main dining room, an more intimate corner of the restaurant, dining alfresco on the patio, or sitting at the sushi bar watching the masters at work! The beverage and food menus are extensive! Take a moment to peruse them for something that piques your interest, and be ready to do so again and again! The menus and/or your server will tell you what's new on the menu. Eight Sushi Lounge is an excellent pre-theatre dining option, especially if you're going to nearby Actor's Exress or Out Front Theatre. During dinner, parking is available in the adjacent parking deck for a $3 fee. The restaurant does not own or operate the deck, however they have worked it out so that you can add your valet parking fee to your dinner tab. Just take your dining receipt to retrieve your car and be sure to bring cash so you can tip your valet attendant. OF NOTE: Eight Sushi Lounge opened its doors in 2015, but the owners are not new to the restaurant scene. In fact, this is a new endeavor of multi-generational ownership. I've not yet met the family that owns the restaurant, but hope to have that opportunity during another visit very soon. I want to share with them just how AWESOME our experience was! "Compliments to the Chef!" and, again, "Thank you, Ivy!" for a wonderful dining experience at Eight Sushi Lounge. We'll see you again soon, and we're bringing friends! Loved reading this article and I will have to check out best sushi near me!